That's not rocket science, so why are so many people still struggling with it? Is it because "the rules" are more complicated? Are they missing the "weird trick" (spoiler alert, there are no weird tricks), supplement or superfood that would make it all fall together? The mechanics of weight loss and body composition really aren't that complicated. What is complicated, is the psychology. The problem is that eating isn't just about putting fuel into our bodies. It's also about sensation (ever eat when you are bored? There's a lot of stimulation in a tasty snack), emotion, memory and social expectation. The more I talk to people who struggle with healthy eating habits, the better I understand that adjusting someone's eating starts not with directing them to a healthy plan, but by understanding what other inputs are driving them to eat outside of their bodies' needs. If those aren't resolved first, then they are set up to fail. I'm going to look at one of these issues today, it's about social eating and I know it's a problem that my clients have. So you are with friends, and they all want to get fast food, or go to that restaurant that has nothing on the menu that fits into your current eating plan. You don't really want to eat that but.... peer pressure. Or it's a big family gathering and there's a huge buffet and people keep offering you food and it would just be rude to refuse... right? Or you are at your Gran's house and you're having a nice cup of tea, but she's made you your favourite cake from when you were a kid and you had a small slice and now she's offering you another and while you don't really want it, or need it, you know that refusing might offend her. So you eat it anyway, and leave feeling bloated and disappointed with yourself. 1) You can't regularly consume foods that are high calorie/fat/sugar in excess AND expect to lose/maintain a healthy weight. That's your choice to make. 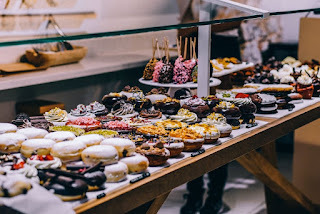 2) When I'm talking to clients about this phenomenon, they freely admit that they actually didn't want to eat said foodstuff, but did so only to avoid offending someone. Lets rewind on that. Knowingly but reluctantly sabotaging their own goals and ultimately health, to avoid social awkwardness. And we all do it at some point. The first advice I ever encountered for this situation was something like "ARE YOU REALLY GOING TO LET SOMEONE ELSE'S MISPLACED FEELINGS KEEP YOU FAT?" It is much, much easier to manage your eating if you know in advance what you are going to do. Some people like to plan their day's food in advance, then they know what they are eating and anything off-plan is off limits. That makes it much easier to stick to your guns, there are no grey areas. You can absolutely write your indulgent foods into this plan. You can treat Gran's cake as your "cheat" food (if you are into that) or take account of the calories. I still share a tub of ice cream with my partner now and again, but I do so on days when I have been active, and careful enough with my other meals to have a "spare" few hundred calories at the end of the day. That's doable. You don't have to deprive yourself if you are sensible and do really want the food. But what if you don't want it? Plan your "thanks but no thanks"
If you don't want it, it really helps to have prepared a way to say "no". What you actually need, is a firm, but polite way of saying no, with no backsies. So I asked an expert! Assertiveness allows open and honest communication so that we can act in a constructive way towards each other based on the premise that everyone has rights. These rights have responsibilities attached to them. You are responsible for yourself as a person and no one should take this away from you. On the other hand this also means the same for others. Other people are responsible for themselves and you should not be manipulated into shouldering their responsibility nor take it away from them. Assertiveness enables you to insist your rights are respected and to speak up even though there maybe fears or worry getting in the way from doing these things. If you don’t you are not being true to yourself and you can end up doing things you don’t want to do and feeling pretty cheesed off long term! How do we do this? Good question! There are several ways to be more assertive. It is important to check your intent that you are being respectful to the other person and then work out how you wish to express what you want to say. It helps to start off with outlining what is going on so the other person is clear without making it personal. Then say what you would like to happen or how you feel in the situation. If, for example you wish to firmly but graciously refuse say Aunt Vera’s 8th portion of cake without offending you could say "It is great to be offered cake but the situation is that I am currently not eating cake". We can also use a technique called the broken record where you politely say it again maybe changing the wording a little but with the same message. "Thank you for the offer, but I am not eating cake right now". Knowing what you want from the situation helps you to keep your focus so you can repeat the message and keep to your goals. You may start to feel guilty. However no one can make you feel guilt unless you let them and you, just like everyone else, are responsible for expressing what you want and feel in a given situation. So there you are! Do check out Sarah's upcoming workshops if you want to know more about how to use assertiveness to improve your work and personal relationships. Practice before you go out, it's cliched, but do stand in front of the mirror saying things like "thank you, that is so kind, but I don't eat that anymore". The more you say it, the easier it gets. The more comfortable you are saying it, the more willing people are to accept you at your word. Identifying the trigger points that lead to us breaking our own rules is a key part of the process when establishing healthy habits. It's not always easy to stick to your programme, but recognising where potential bumps in the road might crop up, and having a plan in place makes a huge difference. If you need help or support in establishing healthy habits, why not check out my online or in-person personal training packages?